A few weeks ago my ancient mobile phone packed up on me and I was forced to have a 'smart' phone. That meant I an now able to 'enjoy' the delights of phoneography. I'm sure that more expensive phones are better as cameras, but one thing is for sure, in decent light even my simple 6 megapixie can make pictures which are good enough for blogging. If good enough means in focus and correctly exposed. In deference to the shape of screens these days I took most of my pictures in the native 16:9 aspect ratio. Yesterday I took the opportunity of a free and sunny afternoon to chase some roach at Sheep Lake. While I was there I played around with the phone and my other cameras. See if you can tell what kind of device made them! 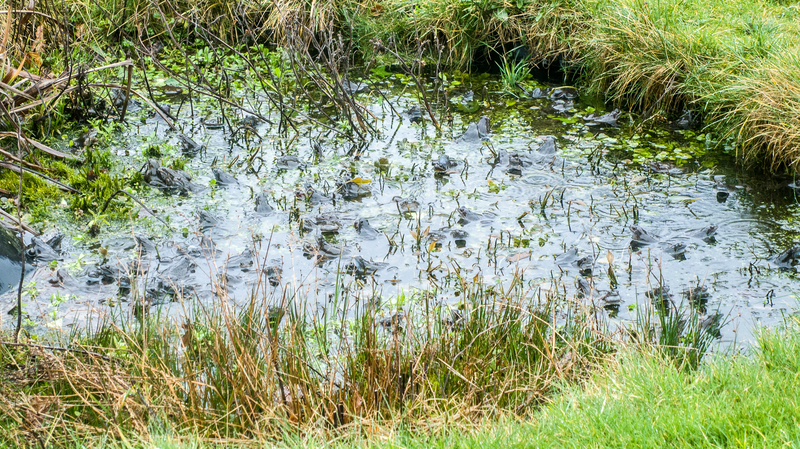 After videoing the frogs in my pond I thought I'd also try my hand at what seems to be taking over fishing blogging for people who can't write - video. Way back I made a few clips with my old cameras when fishing, but things really have moved on in just as few years. Even compacts can produce high quality results. I don't own, and have no plans to buy, a GoPro with it's give-away neo-fisheye lens that gives every video shot with one the same look. Fine for point-of-view footage, but it becomes tedious when used for everything. Not having had the roach rods out since this time last year it had been a bit of a struggle to find what I required. 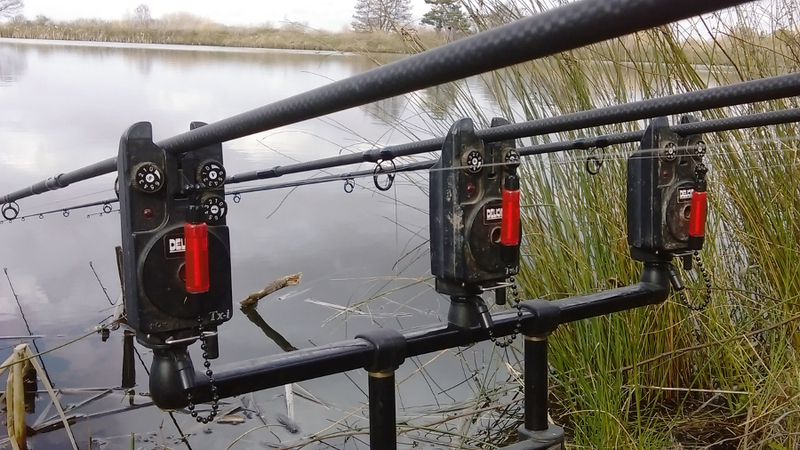 The rods were still rigged up but the feeders had gone AWOL. After a bit of rummaging around I scraped together enough to see me through a session. I even threw in an in-line cage feeder I'd tried once before. 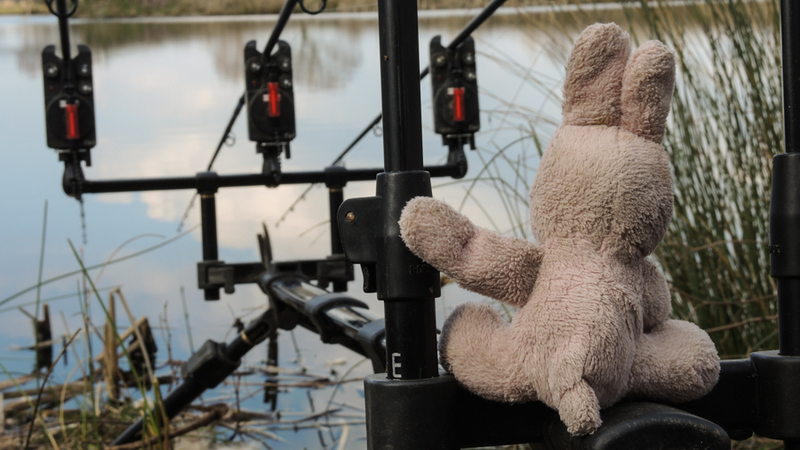 That proved to be a good move as when I started to tackle up I found one of the power gum rigs was goosed. 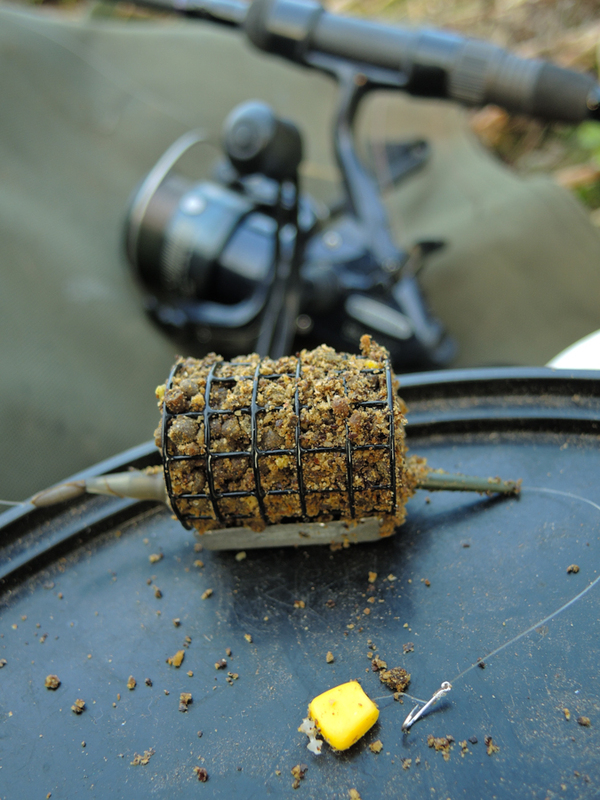 Two rods fished open end feeders filled with crumb and pellet mix with maggots on the size 20 hooks - a single maggot on one, two on the other. These were cast out to a marked spot. The third rod had the in-line feeder, and a small piece of fake corn as bait. This was chucked as far as I could get it and left to its own devices. The afternoon was warm with little wind. Most pleasant to sit back and soak up some sun between re-filling feeders and recasting. A nice relaxing way to spend some time after the frantic (by my standards!) rod building of the last month. When the sounder started to bleep I was amazed to see the spool spin briefly on the corn rod before the bobbin dropped back. A liner? I wound the rig in to find the stop above the feeder had slipped. A take. Back out went the rig. The light breeze, only just enough to ruffle the water, swung through 180 degrees. A dabchick cruised round a bush and crash-dived when it spotted me. Canada geese made a racket. Around four thirty the temperature started to drop. I'd worked up a sweat walking to the swim and had removed my fleece from under the bunny suit before tackling up. It was warm but not warm enough for me to manage without the suit. I was glad to put the fleece back on and replace my baseball cap with the woolly one. Not to mention put on my fleece mitts. It was ten past five when the sounder warbled again. 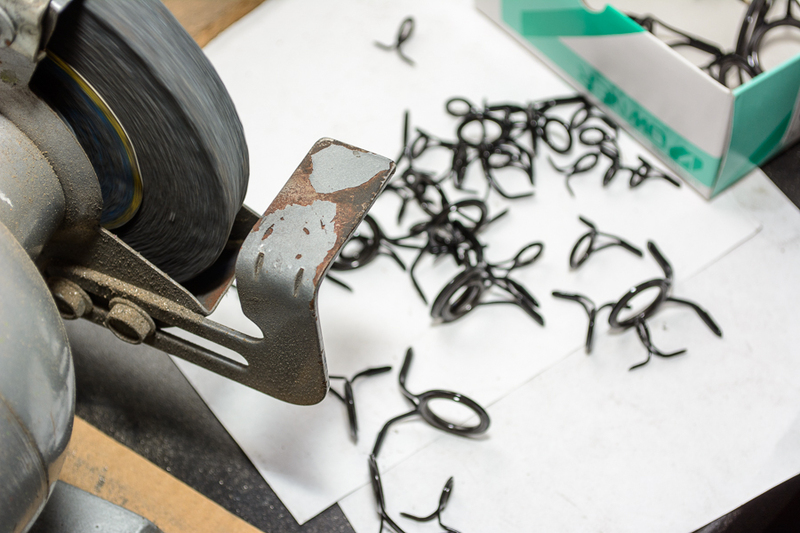 This time the same spool was spinning steadily. I lifted the rod and felt a fish. Not knowing what to expect I knocked the anti-reverse off just in case it was something verminous. It didn't seem to be. In fact it felt like a roach. No runs just a slowly zig-zagging path back towards me with a few gentle head-shakes. IT felt like a decent roach too. Under the rod tip I had to steer it away from the other two lines to prevent an almighty mess. Been there. Don't want to do that again. When the fish popped up it had a red eye. It's scales weren't large and silvery though. They were tiny and olive green. 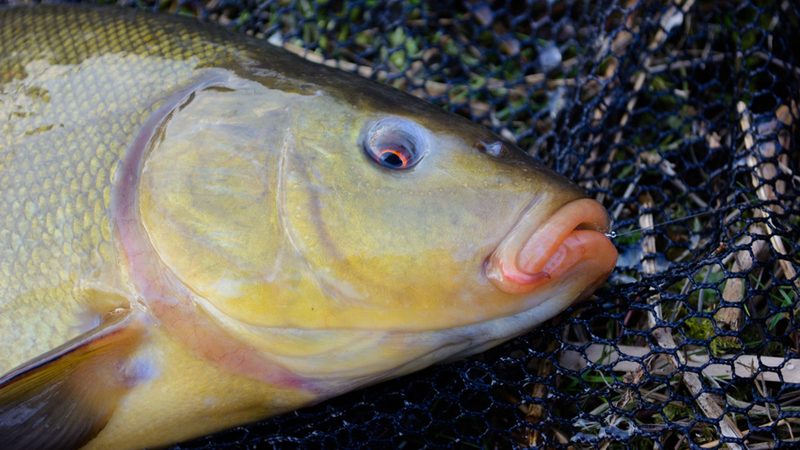 As soon as the fish saw me it started to fight like a tench should! Despite waking up it slid into the landing net at the first attempt. Far from a big tench, maybe a couple of pounds (or five to someone who never weighs tench...) at least it had saved a blank. But was it telling me something? Should I get the tench rods out? When the light began to fade my hopes of a roach or two rose. It was not to be. The maggot bobbins didn't so much as flicker. My dilemma now is whether to have another roach session (I've bought some more feeders in case) or to break out the tench rods. Decisions, decisions. Below is my cobbled together video footage. Watch and be bored to tears! The trouble with video is that to do it well you need to shoot a lot of footage, from different viewpoints simultaneously. You also realise you need things like external microphones to improve the sound quality. Then a few filters might come in handy and before you know it you're going fishing in order to make videos! The good thing about being self-employed is that I can be masochistic listening to England playing cricket in Australia at thee in the morning without having to think about getting up and going to work. The bad thing is that when I have a lot of work I can't put it off. Which means that I have had my nose (almost literally) to the grindstone since the last blog entry and am still trying to catch up with new builds, repairs and refurbs. All this means that I missed the end of the river season without making a trip to the local drains for some back end piking. Perhaps the tench will be bubbling by the time I can manage a fishing session. Although that usually means they are uncatchable! Back at the pond the frogs have spawned and are now dispersing. 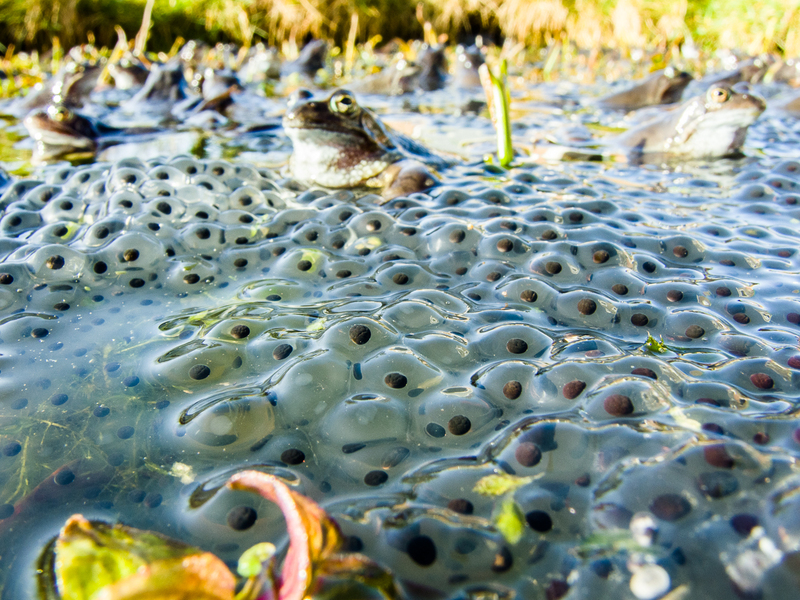 Time to keep checking the development of the tadpoles, which should be fairly safe from avian predators with all the weed to hide in. Fingers crossed. I knew I was going to get busy, so a week last Thursday I fled to the waterside after lunch. It was a lovely pre-spring day of sunshine with a wind to ruffle the surface. A bit bright for pike until dusk, but that didn't stop me trying a few swims before settling into the one I'd caught from on the previous session for the last two hours. It was around five when a few small fish started to show, leaping in the wavelets. Pike action was anticipated because such activity had preceded the run last time out. Sure enough at ten past the middle float, with a legered bluey tail on the hooks below, dipped then set off on a steady run. I picked the rod up, wound the reel handle to disengage the baitrunner, felt the weight of a fish and struck. All too briefly the fish pulled back before the bait came free. The hooks had shifted in the bait but it wasn't badly mauled. With the upper hook repositioned securely enough for another cast back out went the bait. Not quite to the same spot, but close enough. Thinking I'd probably blown my chances I sat back in the low chair and sulked. Twenty minutes later there was a single bleep from the sounder in my fleece pocket. The floats didn't seem to have moved. Odd strong gusts had been causing single bleeps from time to time. One of the few drawbacks to braid is that it is more easily blown about than mono. Two more bleeps and a scan of the floats showed that the middle one was moving just as the sounder began a continuous wail. This run seemed more positive and my strike was met with a sustained resistance. Just like the fish from the last session all there was was a weight that could have been a middling fish or something better. 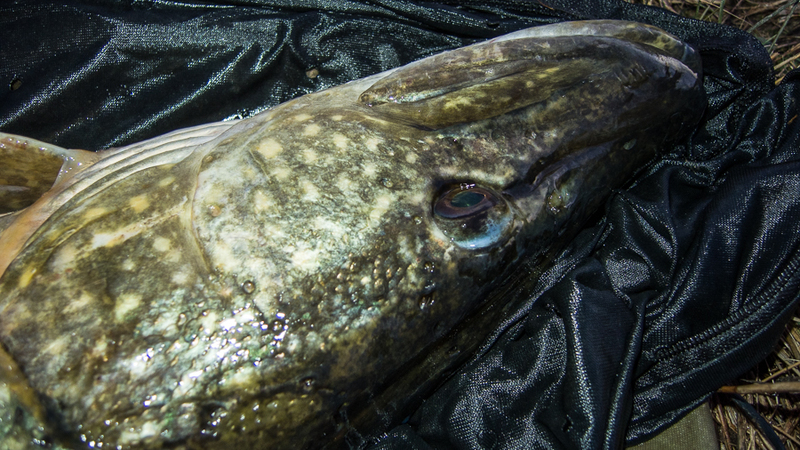 As I drew the pike closer I felt that sensation of the line plucking over a fin, or maybe a hook slipping. And again. If there was a light hook hold I wanted the fish in the net quickly. A rod length out there was a big boil on the surface as the pike changed direction and came towards me from the left. Then I got her head up which resulted in an open-mouthed head shake with flared gills. Fearing a loose hold for the hooks I hustled the fish into the net and breathed a sigh of relief. It looked a longer fish than I'd had all winter, and chunky round the shoulders. Leaving the net staked in the edge I got the scales and sling readied before lifting what felt like a respectable weight ashore. That was the cue for a mad twisting and writhing session from the pike. After the untangling session I found the hooks were free and my fears might well have been grounded. Lifting the sling I suspected that I wasn't going to quite manage a twenty. So it was. far from unhappy I sacked the fish and set up the camera for a few self-takes. Before getting the sack out of the margin I wound the other two rods in. There was a chance of another run, but I couldn't face the mayhem that would cause! Two shots of each side and back she went, swimming away strongly. By now it was almost dark and I tidied the swim by the light of my Petzl. The following day a load of blanks and fittings arrived and I've been catching up with work. Conditions have been ideal for more pike sessions but I haven't managed sufficient free time to make the effort. I haven't even felt like writing anything for the blog until this lull in proceedings over a week later. Now I'm almost on top of things it's got more springlike still and the pike might well be thinking of spawning, like the frogs in my pond have. Bang on cue the first spawn appeared today, previous years seeing it arrive on the 7th, with last year being early on the 4th. Yesterday while waiting for some glue to dry I went and photographically pestered the frogs. 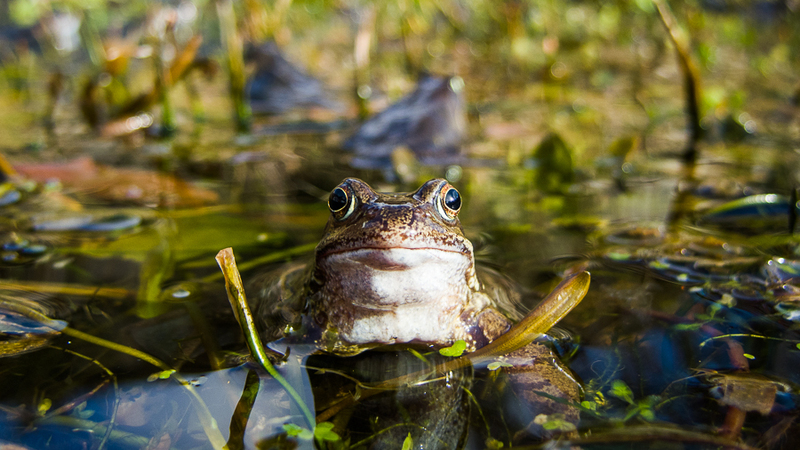 Today a head count from a photo revealed at least 83 of the croaking amphibians were in residence! I also played around shooting some video footage. Video is something I'm sure I could enjoy making. If only it wasn't so demanding of gadgets, and expensive gadgets at that, to get great results. A tripod or some other means of stable support makes a big difference. I used a Gorrillapod for most of the video and the difference is marked between that and the hand-held stuff. The wind noise from the cameras' built in mics is annoying, so an external mic with a dead cat would be required to improve that. Then there's the matter of pans and zooms to make things more interesting and it's all outlay that makes still photography look cheap! Anyway, this is the result - edited quickly using primitive software. With the warming trend expected to continue I might hang up the pike rods for this season and break out the roach rods for a couple of sessions before attacking the tench with carp tactics. 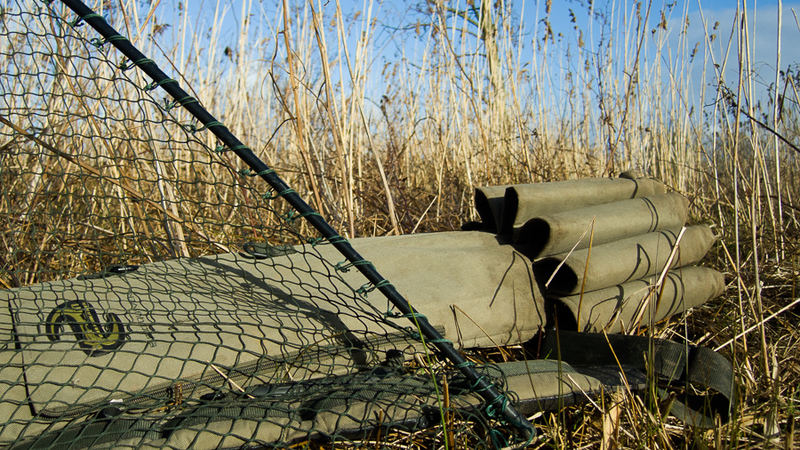 Well, tench tactics didn't work last spring so I've nothing to lose. I just hope that I can avoid catching carp.